"Yours, O Lord, is the greatness and the power and the glory and the splendor and the majesty—for everything in the heavens and on earth belongs to You! Yours, O Lord, is the kingdom, and You are exalted as head over all." 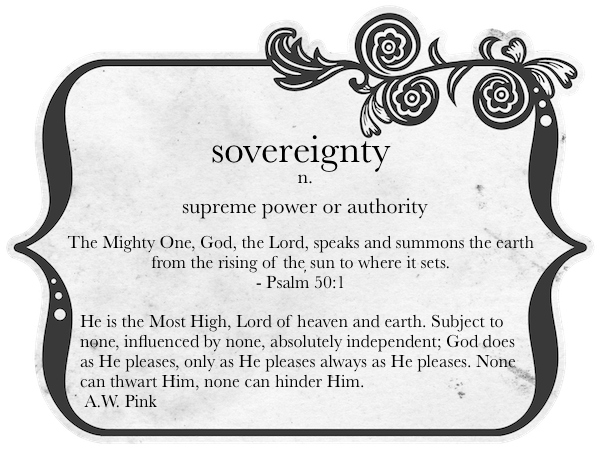 Sovereignty is one of my favorite attributes of God. Like all his other attributes it is immense in its nature. We could spend eternity thinking and talking about it. And I believe we will. God exercises his power in creation, salvation, and even the personal lives of all people, making it one of those doctrines people either love or hate. Many love the sovereignty of God in creation but hate it in salvation. God’s power in creation is easy to marvel at, but his power in our salvation can feel a bit too personal, a little too invasive. Yet it is only a power as strong as God’s that can change a cold heart of stone into a heart that beats with love and affection for God and fellow man. Apart from God’s sovereignty in salvation we are left to our own ways and lost in our own powerlessness. Sometimes one’s frustration with God’s sovereignty stems from a lack of understanding. Sometimes it comes from a selfish desire to have the authoritative say in our lives. It’s easy to see ourselves as much bigger, wiser, and deserving than we actually are. When we do, we will hate the absolute sovereignty of God. Knowing and understanding the sovereignty of God will change us. It will produce the fear of the Lord, a humble spirit, and can fill our hearts with comfort and a feeling of safety and peace. Until He bids—I cannot die! We are secure in his hands. No matter the storms we face, the temptations we fight against, or the sins we fall into, nothing is more powerful than our great God. Studying (and embracing) the sovereignty of God can banish worry and fear and fill our souls with praise. Praise that his power is coupled with love and goodness. Praise that the defeat of evil is not a matter of “if” but “when.” Praise that no matter how confusing or difficult life is God is on our side and will use his power for our good. It will give us confidence to follow after God’s calling because no matter how messed up we are the absolute power of God can overcome anything. And herein is the preciousness of this truth. God wills only that which is good—and His will is irreversible and irresistible! God is too wise to err—and too loving to cause His child a needless tear. Therefore if God is perfect in wisdom, and perfect in goodness—how blessed is the assurance that everything is in His hand, and molded by His will according to His eternal purpose!